Great phone. Been an Android user since 2009 (Galaxy Spica FTW!) and I must say the switch to the Apple ecosystem was well worth the wait. It is less restrictive now and I could clearly experience it with iPhone 6s. I am having issues with 3D Touch. There are multiple instances when it gets triggered even when I am not force pressing the display. Mostly during typing. Apple service centre thinks that it is normal so it could just be me. Very slippery if you don&apos;t use any cover. Overall its a good phone to buy even though it is now no-2 phone in criteria of features but the most successful series in iPhone history is 6 series. It&apos;s a good phone to buy b/w 50000/-. It has good camera and great battery life and quite fast charging also. Pros-3d touch is great feature that works on amount of the pressure you applied on the phone a pop-up window comes and you can choose some of the Common features and there are many more features in the 3D Touch. 4k video - you can record photo videos on the iPhone 6s both in slow motion and normal video. Handsfree SIRE: no you don&apos;t have too long press the home button to activate Siri now you can activate Siri just by saying hey Siri and it starts working. Lightweight and sleek design. And many more feature are there. Cons: some of the apps like Home, Apple maps that doesn&apos;t work good in India. Apple users do not have access to free songs, videos. This mobile is user friendly and has an elegant look. Camera quality is very catchy. I&apos;ve been using this phone(iPhone 6s) since a year and it has been working perfectly well since then. The best phone you can ever get under ₹40,000. Top of the line features with 3D touch...the most useful feature for a phone ever. 55 Pricebaba users have written their experience with Apple iPhone 6s. If you own Apple iPhone 6s, please do leave your feedback too. It's been a pattern since 2011, where Apple releases a new version of an iPhone every other year. It retains the same design as its predecessor but has one killer feature that sets the industry standard for years to come. The iPhone 4s had Siri, the iPhone 5s had Touch ID, and in 2015, the iPhone 6s and iPhone 6s Plus have 3D Touch. This year's iPhones look the same as the iPhone 6, with the exception of the new Rose Gold (a.k.a light pink) colour option. The iPhone 6s has the same 4.7-inch, 1334 x 750-pixel display while the bigger 6s Plus maintains the 5.5-inch 1920 x 1080 pixel display. Although they may appear the same as last year's displays, one major change is the inclusion of 3D Touch. Capacitive sensors are integrated into the backlight of the Retina HD display, that measures microscopic changes in the distance between the cover glass and the backlight. These measurements are then combined with signals from the touch sensor and the accelerometer to provide an accurate response to finger pressure. The software in iOS 9 responds to different levels of pressure, resulting in two gestures called Peek and Pop. You can peek into content without leaving the app by pressing lightly or press harder to jump into the app. For example, you can view a web page by lightly clicking the link in the browser, without going to that page. Or you can press down on app icons to invoke frequently used shortcuts of that app. There are many such interesting use cases of 3D Touch that will be further explored when app developers start implementing it in their apps. Also, supporting 3D Touch is the Taptic Engine, that generates precise vibrations that are used for haptic feedback when you interact with 3D Touch. Beyond the display, these iPhones also come with a higher 12-megapixel resolution rear camera. Because of the bump in resolution, they can finally shoot 4K videos now. There's also a new feature called Live Photos; that records a few seconds of video before and after a shot is taken, which can be seen once you press hard on the screen in the Photos app. Both iPhones are powered by Apple's 64-bit A9 chip, which is said to be 70 percent faster in CPU tasks and 90 percent fast in graphics tasks than the A8 chip. Some people have even compared its performance to the 12-inch Macbook and found that it is very close. iPhones receive a lot of flak for their battery capacities and the 6s is no exception. It packs a 1715mAh battery which is barely enough for a day of moderate usage. A not-easily-noticeable change in the physical aspect is the use of 7000-grade aluminium; which has strengthened these iPhones to a point where last year's iPhones were easily bendable, but according to some Youtube videos, this year's aren't. Lastly, although it has been discovered that the battery capacity has been reduced a little (possibly to accommodate the 3D Touch display technology), the improvements in power efficiency of the new A9 chip and iOS 9 apparently compensate for that, as Apple states the same battery life as the last generation. iPhones were never meant to be cost-effective, value-for-money smartphones. Their launch prices amply suggest so. They've become objects of desire that people will pay a high sum to own. To previous iPhone users, the iPhone 6s and iPhone 6s Plus bring in enough number of improvements to make it a worthy update. - Apple iPhone 6s will support single Nano SIM only. - Charging and data syncing can be done via the Lightning Port on the iPhone 6s. A USB Type-A to Lightning connector is supplied with the phone. 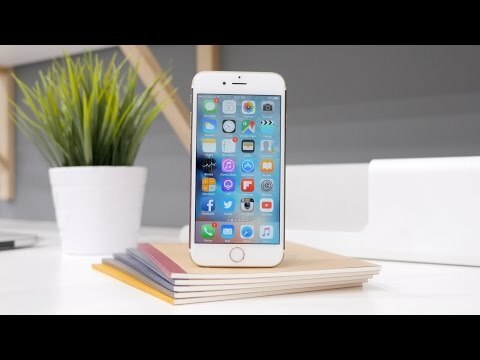 - Apple iPhone 6s was the first phone receive a 12MP camera with 4K video recording support. And yes, you can also record Slo-mo videos with the phone's rear camera. - No, the iPhone 6s is not water resistant. However, you may check out the iPhone 7 or the iPhone 7 Plus that feature IP67 water & dust resistance. - The box of the Apple iPhone 6s consists of the device itself, wall charger, a lightning cable for charging and data syncing, a pair of in ear Earpods and a SIM ejector pin.